Product Description The Stratagene Robocycler has 4 separate temperature blocks that remain at set temperatures. In the Robocycler, tubes are moved from one block to the next by the robotic arm in order to cycle the temperature of the samples, thus there is no ramping times. Reduces Run time by up to 30%. 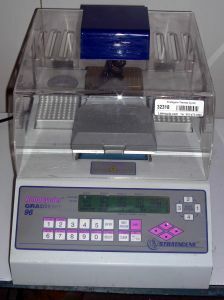 The RoboCycler Gradient temperature cyclers provide the same precise temperature control as all of the RoboCycler models: adjacent well-to-well uniformity for the three standard blocks and 0.25C for the gradient block, as well as all of the other outstanding features of the standard RoboCycler temperature cycler. Add the patented gradient feature that cuts your workload and simplifies your PCR reactions, and you have the most innovative and sophisticated temperature cycler in the world. The RoboCycler temperature cyclers offer a well-to-well uniformity of 0.1C.